Position limits are aimed at curbing speculative excesses, which some blame for the spike in oil prices in 2008 and the 65% increase in prices over the past 12 months. A particular target is the passive investors putting money into buy-and-hold oil futures funds. These funds do create demand for futures. But the effect on oil spot prices is more subtle. Passive investors raise the price of futures relative to the spot price of oil. That’s a big reason why the oil futures curve has sloped upward for most of the past five years, corresponding with when investment in commodity funds really took off. As energy economist Phil Verleger observes, that premium for oil delivered further out in the future can create an incentive for sellers of futures to buy physical oil, store it and sell it forward. The result is bigger inventories of oil, acting as a buffer against shortages arising from unexpected swings in oil supply or demand. Mr Verleger points to this winter’s cold snap, which should have caused heating-oil prices to spike but did not due to the security provided by high inventories. It’s worth remembering that after oil prices crashed in 1998, OPEC specifically targeted cutting global oil inventories to raise prices. As the past decade has demonstrated, it certainly helped in that regard. This is why OPEC would love to see passive money forced out of the futures market. This would reduce the premium to spot prices and, hence, the incentive to store oil. 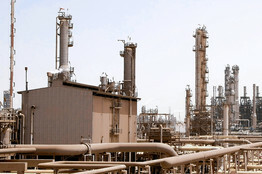 Initially, the unwinding of these trades might cause oil prices to drop significantly as barrels flooded onto the market. Longer term, however, lower inventories would hand market power back to those producers controlling the world’s swing spare production capacity: Step forward OPEC. In another interesting twist of timing, OPEC’s chart only begins in September 2009. As Deutsche Bank points out, extending the analysis back just to early 2008 would show a period during which net long positions on Nymex were falling yet crude was racing toward its all-time peak. It puts correlation between changes in net positions on Nymex and oil price moves at 17%—positive but hardly in lock step. Even if OPEC’s timing is off, the sight of a cartel bemoaning market distortions really should raise a smile. 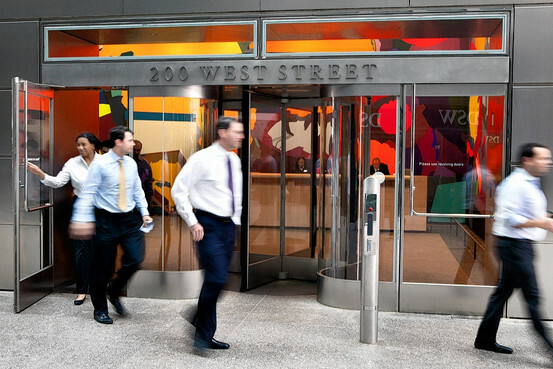 Goldman Sachs Group Inc.’s thrashing in Washington left many employees angry, some discouraged and others worried their email and other internal documents could be snatched by regulators and investigators. “Let me remind you that we should anticipate continued external focus on Goldman Sachs for the foreseeable future,” Goldman Chairman and Chief Executive Lloyd Blankfein said in a voice-mail message to employees after what he described as a “rigorous” hearing by the Senate Permanent Subcommittee on Investigations on Tuesday. “Please do not let this distract you from your daily responsibilities,” he said. Bloomberg News Goldman Sachs’s employees paid close attention to the testimony of firm officials, some from local watering holes. Here, company headquarters. Some employees of the New York company told each other how unfair it seems to them that Goldman is being singled out for betting against the housing market in 2007 as it was pitching mortgage-backed bonds to certain clients. Many other Wall Street firms did the same thing but escaped the relentless, nearly 11-hour pummeling Goldman got. On Wednesday, Goldman employees still were sizing up the performance of Mr. Blankfein, accused trader Fabrice Tourre and other current and former executives who testified before the Senate panel. Some people at the firm said Mr. Blankfein seemed insufficiently apologetic, focusing too much on Goldman’s role as a trading operation and not enough as a trusted underwriter securities sold to clients. One particularly shocking disclosure to Goldman’s current mortgage traders, according to one of them, came in the employee performance reviews that were unearthed by the Senate committee. Some traders wondered aloud if their own internal communications would remain private. Traders, including those in the fifth-floor mortgage division of Goldman’s headquarters at 200 West Street in lower Manhattan, have been reminded by their bosses to stay focused and keep doing business as usual despite all the distractions, according to people who heard the remarks. Before Tuesday’s hearing, Jeffrey Verschleiser, one of Goldman’s mortgage-division heads, spent days poring through email and other documents to help executives prepare for their testimony, said people familiar with the matter. Other employees in the group assisted. As the hearing dragged on, employees and alumni fired text messages, emails and instant messages back and forth about the group’s performance. One Goldman employee said he was invited to tag along with a group of traders who said they were heading to a bar to watch Mr. Blankfein’s testimony. He said they joked that they planned to down a shot of liquor every time the CEO used the word “synthetic,” a reference to the type of collateralized-debt obligation for which Goldman has been accused of fraud by the Securities and Exchange Commission. —Carolyn Cui and Joe Bel Bruno contributed to this article. There was a lot to digest from the 10-hour-plus grilling endured by Goldman Sachs Group executives Tuesday, and the media’s coverage was fairly encyclopedic. But one line of questioning that doesn’t seem to capture much attention is Sen. Tom Coburn’s probing into why Goldman publicly released the emails of Goldman trader Fabrice “Fab” Tourre. The Oklahoma Republican raised the issue early in the hearing, asking the Goldman executive how it made him feel that his employer had released his emails. Mr. Tourre refrained from any criticism of Goldman action, but he seemed rattled by the question. Deal Journal spoke with a couple of legal experts on Monday, before the hearing, who said it was in Goldman’s interest to stick with Mr. Tourre. First, the investment bank has stated publicly that it stands behind Mr. Tourre and it would be awkward to reverse course. Second, Goldman may need Mr. Tourre as much as he needs Goldman. Left to defend himself, Mr. Tourre could turn on his former firm and, potentially, disclose embarrassing information about it, the lawyers said. And of course, Mr. Coburn could simply have been trying to portray Goldman as heartless and unseemly in an effort to discredit the investment bank’s claims of having high ethical standards. Indeed, later in the hearing Mr. Coburn asked Goldman finance chief David Viniar whether he thought it was “unethical” to release Mr. Tourre’s emails. Mr. Viniar said he thought there was nothing unethical about it, but that he wasn’t involved in the decision to release them. Mr. Coburn later asked CEO Lloyd Blankfein about the email release. Mr. Blankfein also said he wasn’t directly involved in releasing the emails. Mr. Coburn pressed both executives, asking why Goldman didn’t release emails from other employees. Neither seemed to have a ready answer. Regardless, Mr. Coburn’s questioning seemed only to make Mr. Tourre more sympathetic in the court of public opinion. When it comes to fashion, no success is sacred. Last year, the Shashi bracelet, a bauble of macramé and rhinestones, was on Lindsay Lohan’s wrist and sold for about $60 at Henri Bendel and Intermix. Now, American Eagle Outfitters Inc. is selling similar-looking bracelets priced at $12.50. “It’s not fair,” says jewelry designer Yuvi Alpert, who, along with his business partner, Danna Kobo, makes and sells the Shashi bracelet. While the design continues to sell well, the Shashi bracelets’ retailers have complained about less expensive look-alikes on the Web and in stores, Mr. Alpert says. “I can’t know of how many people didn’t buy Shashi bracelets because of it,” he says. American Eagle Outfitters declined to comment. When it comes to fashion, no success is sacred. Emerging designers are especially prone to cheaper knockoffs. Here is a side-by-side comparison of the originals and their knockoffs. Emerging designers like Mr. Alpert and Ms. Kobo are tiny fish in a global fashion food chain that seeks an endless supply of new trends. The fashion world is ravenous for new jewelry, accessories and clothes to fill the shelves of retailers and Web sites, many of which seek to offer fresh inventory as often as every two weeks. Often, existing designs become the inspiration for new, mass-produced pieces. Small designers face a particularly large burden; often, they lack deep pockets to chase down versions they find similar, and their brands are so little-known that customers often aren’t aware they’re not buying an original design. Scarf designer Elle Sakellis says she wondered why the trendy retailer Kitson didn’t reorder her $190 Otrera “evil eye” scarves. Ms. Sakellis created the scarves after seeing a wall of luck totems meant to protect against the “evil eye” in a store in Mykonos, Greece. Kitson and Intermix bought them, and they sold well, she and the stores agree. But soon, a scarf with a similar motif, made by a company called Raj Imports Inc., showed up at Kitson for about $30. Then polyester versions appeared on Web sites for as little as $10. Store chains and manufacturers are constantly searching for new ideas that can be mass-produced. The Web sites, “look-book” catalogs, and trade shows where emerging designers show their wares to the press and retail buyers can become sources of ideas. “There are buyers who buy [designs to copy] for a living,” says Michael Heimbold, a partner with the law firm of Steptoe & Johnson whose clients are often the defendants in copycat lawsuits. “They go to a show and say, ‘this is cool, let’s make one.’ ” Mr. Heimbold isn’t familiar with the Shashi bracelets or the scarves. Tracing the originator of a design can be challenging, because designers are always looking to other sources for inspiration, from ancient symbols to the recent “military” trend. But fashion creators make motifs their own through design choices. 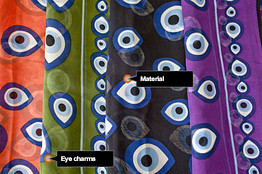 What makes the “evil eye” scarf special, for instance, is not the fact it has the symbol but the placement and size of the symbol, the border, and the choices of fabric, color, and details such as beads hanging off the corners. Trendsetting stores that carry independent designers’ work—stores like Kitson and Fred Segal in Los Angeles, New York City-based Intermix, and Colette in Paris—also help spread ideas. Their celebrity clients feed new trends to a hungry global audience. The Shashi bracelet became part of the trend machine when Ms. Kobo created the Shashi bracelet. Her partner, Mr. Alpert, initially dissed the pieces as too “girly.” But after the bracelet was introduced at Henri Bendel and Intermix last May, influential stars including Ms. Lohan and Katy Perry were soon wearing them. By December, Mr. Alpert and Ms. Kobo had sold 10,000 of the bracelets. The Shashi helped fund the young designers’ development of their more expensive Ruby Kobo jewelry line, for which they won a 2010 Council of Fashion Designers of America “Incubator” award. By February, the bracelets’ retailers began complaining about less expensive versions, Mr. Alpert says. The American Eagle Outfitters bracelet come in a variety of colors like the Shashi’s, and it’s hard to tell the difference between them, except that the American Eagle bracelet’s string seems weaker and coarser. Mr. Alpert and Ms. Kobo have applied for a patent on the Shashi and say they had an attorney send cease-and-desist letters to American Eagle Outfitters and about a half-dozen Web sites. But it is costly—and seems impossible—to slow the flood of imitators, they say. This week, Mr. Alpert says, the Trendy Room boutique in Port Orange, Fla., cancelled an order of Shashi bracelets, saying cheaper versions are available. The Trendy Room co-owner responsible for the decision couldn’t be reached for comment. There’s a bill bouncing around Congress that would allow clothing designers to copyright their creations. But critics argue it would benefit only big brands that have the resources to apply for and protect their copyrights, trademarks and patents. The most effective response to the current environment, according to some small designers, is a steady stream of new material. Mr. Alpert says he and his partner have stockpiled more than a year’s worth of new Shashi designs. Ms. Sakellis’s latest look is a hamsa hand scarf, featuring the Middle Eastern luck charm. “The hamsa scarf will get knocked off, too,” she says, “I just know it. One reason some airlines are eager to charge fees for carry-on bags: There’s no room at the (overhead) bin. To avoid checked-baggage fees, more travelers are carrying more bags onboard with them. At the same time, airlines have packed flights with more passengers, on average. That’s led to a real-estate crisis in the cabins—not enough space in overhead bins to accommodate all customers. So more flights are delayed when customers struggle to cram bags into full bins and airline workers have to send bags that don’t fit down to cargo compartments. Mr. Baldanza says Spirit will be able to trim five minutes off each flight—20 hours of airplane time per day. That’s like having two extra $40 million planes in your fleet, and would let the airline add more flights without having to buy more planes. Today, without carry-on fees, Spirit is often gate-checking as many as 20 to 30 bags per flight that don’t fit in overhead bins. Part of the bin shortage is of Spirit’s creation: The airline squeezes more seats onto its planes than competitors. Spirit has 145 seats on its Airbus A319s; US Airways Group Inc., by comparison, has 124. And when “properly packed,” Mr. Baldanza says, the A319 has room for 130 bags. If each passenger puts only one bag in the bin, and every passenger packs the bin in the most efficient manner, then the last 15 people to board a full flight still are going to find bins completely full. Airlines and travelers alike say people are bringing more stuff onboard planes. AMR Corp.’s American Airlines was averaging 1.1 to 1.2 checked bags per passenger before it instituted baggage fees in 2008. It now averages about 1.0 bags or less, according to spokesman Tim Smith. Jason Schneider Better Memory: with their ‘lucky charms’ on hand performed significantly better than those separated from their charms. Moreover, participants with their lucky charms reported that they felt 30% more capable than participants without the charms. Arthur Romanov and Irina Salgan opened their sixth Edible Arrangements fruit-basket shop recently to take advantage of low real-estate prices and easy-to-negotiate contractor bids. 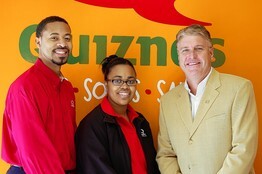 Quiznos Quiznos store operators Steve and Valerie Mallard, left, in their Denver store with John Fitchett, head of a new Quiznos financing program. Despite good credit and a strong track record, the longtime franchise owners weren’t able to secure traditional bank financing, as they had for past expansions. Instead, Mr. Romanov and Ms. Salgan used a lease-to-buy program offered by Edible Arrangements International Inc.’s year-and-half-old financing arm, Farid Capital. As bank lending continues to be sparse, a number of corporate franchisers are providing financing arrangements and other aid to potential franchisees. Though business owners say they’re grateful for the assistance, many of the programs do come with strict terms. Farid Capital’s lease-to-buy program requires most franchisees to contribute about 30% of the costs. But Mr. Romanov says he wouldn’t have been able to afford the $130,000 in start-up expenses without the $60,000 he requested from Farid. “We need all the help we can get,” he says. The moves by franchisers to provide more aid come as many former top lenders, including CIT, Comerica and Banco Popular have severely curtailed their lending, says Ronald A. Feldman, chief executive at Siegel Financial Group, a business consulting firm in Conshohocken, Pa., that specializes in business acquisitions and franchise financing. What we’re seeing is that some franchises will now “provide credit enhancement to banks, such as partial guarantees on the loan,” Mr. Feldman says. Others are helping candidates become more viable before heading into the bank. Dunkin’ Donuts has reduced some of the royalty fees the franchisee would pay, so long as the shop opens in targeted markets. Because franchisees pay those fees on the sales they make, they can show the lender “greater profitability and ability to repay with reduced expenses,” explains Grant Benson, vice president of franchising for Dunkin’ Brands Inc.
At the International Franchise Association, a trade group in Washington, spokeswoman Alisa Harrison says more franchises are brainstorming strategies, such as developing internal financing divisions. “Members have told us some of their highest-quality prospects are still having a tough time getting financing,” she says. Banks are expected to lend $6.7 billion to franchises in 2010, an amount that is projected to fall some $3.4 billion short of demand, according to a study released in December by the IFA and FRANdata, a franchise research firm. Not all franchises are in need of a creative work-around system, as the severity of the credit crunch has varied from franchise to franchise. Prior to the recession, franchisees often found start-up capital at lenders that were partners with the franchiser. But lenders are now more wary of those franchises that carry high loss and delinquency rates. Before the recession, too-lenient franchisers sometimes funneled weak candidates through the start-up process, says Bob Coleman, who collects data on loans backed by the Small Business Administration. According to a preliminary report compiled on loans from the government’s last fiscal year, some franchises had loss rates as high as 27%. As a result, “banks today look at the performance of the franchiser,” he says. Corporate franchisers lending to potential franchisees isn’t new. Sylvan Learning Inc., a tutoring company, and Firehouse Restaurant Group Inc., a Midwest and Southwest chain that owns Firehouse Subs, established lending arms years ago. But some of the newer lending models don’t follow the traditional mold. Quiznos, privately owned by QIP Holder LLC, created a lending division earlier this year that allows parties to buy a store with only a $5,000 down payment. Participants don’t pay the franchise back in predetermined amounts. Rather, owners must funnel store profits—80% each month—back to the company until the loan is repaid, which is expected to take two to five years. 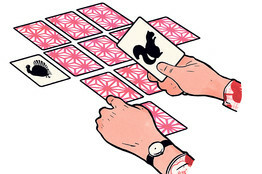 Initial losses are tacked on to the loan. John Fitchett, the program’s president, says the company uses different criteria than banks, rating applicants based on experience and personality first, while other factors such as financial history and credit scores are secondary. “We’re seeking out [candidates] who have a restaurant background, and the savvy to run it,” says Mr. Fitchett. Until the loan is paid off, the store owners are actually Quiznos employees and the store is legally owned by Quiznos. 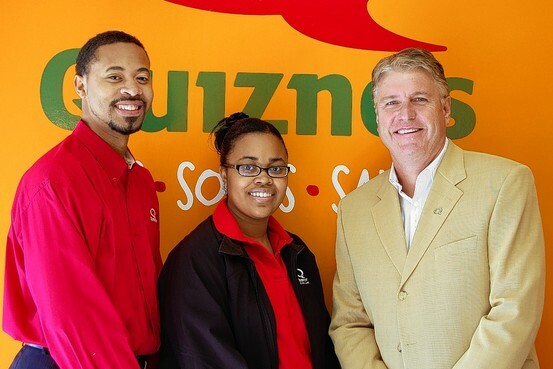 If the store doesn’t turn a profit in 12 months, Quiznos reserves the right to change ownership, Mr. Fitchett says. Eight stores have opened and Mr. Fitchett says he expects about 200 to follow by the end of this year. The program is open to new owners or existing ones who want to expand. Steve and Valerie Mallard, one of the first accepted applicants, opened their Quiznos store in Denver last month and have hired 15 employees. Mr. Mallard, who has a history of working with Subway and Ruby Tuesday restaurants, says he wouldn’t have been able to finance such a store on his own. How to Tackle Government Labor Costs Pay freezes, two-tier wages, pension reform—nothing should be off the table. Years ago, there was an informal “social contract”—public employees generally received lower wages than private-sector workers, and in return they got earlier retirement and generous pensions, allowing them to catch up. That arrangement has long since gone by the boards. The result is a remarkable trend. State and local government employees for years have received pay increases in excess of inflation, and BLS figures show they now have wages that are 34% higher on average than in the private sector. Partly responsible for these trends is unionization, which the Department of Labor reports has jumped to 37.4% of the public sector in 2009 from 24.1% in 1973 (unionization in the private sector declined to 7.2% from 25.4% in the same time period). The result is often pay levels higher than needed to attract qualified employees. The average quit rate among state and local employees is a third of that in the private sector. Public employees also have a 70% advantage in benefits. Health insurance, retirement benefits, life insurance and paid sick leave are not only much more available to them, but much richer. In 2009, BLS figures indicate that the costs of health insurance were 2.18 times as much for state and local employees as for private-sector workers. In the private sector, defined-benefit pensions have declined over the years in favor of defined-contribution plans such as the 401(k). In 2009, defined-benefit plans were available to only 21% of private-sector workers—but to 84% of municipal employees, according to the Cato Institute. And public-sector defined-benefit plans paid retirees about twice as much as those in the private sector. Public-sector retirement costs also are high because many can retire at age 55 after 30 years of employment with pensions equal to 60% or more of final salary, which is often jacked up by lots of overtime in final working years. In some states, employees can “double dip” by retiring early and then resuming their previous jobs or taking other government positions. So they get salaries and pensions at the same time. With slow economic growth, limited income expansion and high unemployment likely in future years, a taxpayer revolt may be brewing. Americans still want basic municipal services like police and fire protection, good schools for their kids, clean streets and garbage collection, but at lower costs and budgets that don’t kick the deficit can down the road. State and local government labor costs can be reduced in an orderly way. Following in the footsteps of bankrupt GM, two-tier wage structures would allow existing employees to continue at current salaries, but pay new hires much lower wages that are nevertheless adequate to attract and retain qualified people. And the new people can be enrolled in defined-contribution pension plans that require employee contributions instead of defined-benefit plans. Retirement ages can be increased. Mr. Shilling, an economic consultant and investment adviser, is president of A. Gary Shilling & Co.